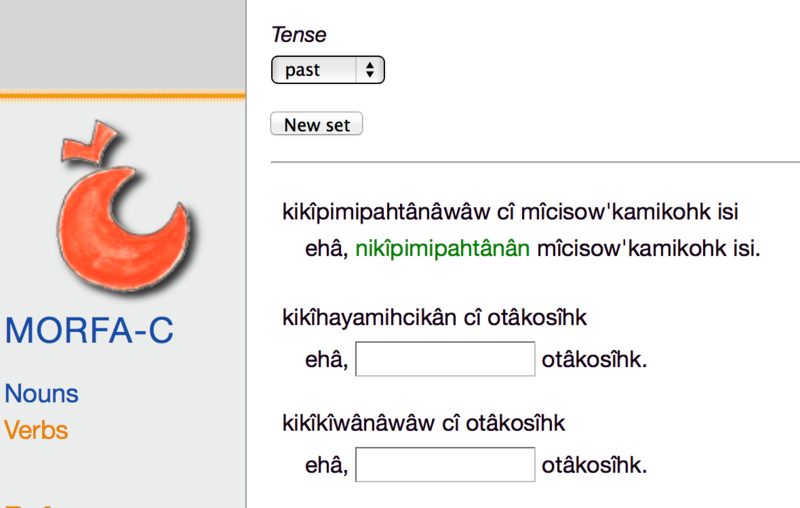 nêhiyawêtân is a learner's aid for acquisition of languages with complex grammar, like Plains Cree. It is developed by the University of Tromsø, and used by students learning Saami languages. The source code it free and open, and the programs can be made for other languages as well, and adjusted to the actual needs. This first Cree demo is made by the University of Tromsø, in collaboration with AltLab at UofA, but further work will be done of AltLab at UofA in collaboration with teachers wanting to use the programs for their students. The programs for Cree belongs to UofA and will be moved to a university server when there is a programmer to maintain it. The programs make tasks for the students, and they can be integrated in course materials, like we have done for North and South Saami, e.g. North Saami Language courses for students. The plan for this fall is not including such integrating for the Cree version. The programs have many choices and therefore can be adapted to the students' level and needs. Still it is not so appropriate for young children, because it is based on written language. Leksa: practice word meaning, from Cree to English/French, or from English/French to Cree. The vocabulary of the coursebooks should be added to the program, so the student can choose to work with the words s/he needs for the class. It's possible to add more languages, e.g. another First Nations language. In this program one may include audio files. In the demo there are at present audio files for some of the words: Choose audio files in the book menu. The program will accept synonyms to the extent that they are added to the program. Morfa C: inflection of nouns and verbs in context (question + answer). The program accepts several answers. For the $2.50 example above, it will in addition accept 'nîso newopehikanak nîyânanomitanaw pîwâpiskos' and 'nîso newopehikanak nîso sônîyâs'. Be aware that the demo is only a start, a fully developed program will include much more tasks. These tasks should be made in collaboration with teachers, and adapted to the coursebook and curriculum so the program will support the instruction in class. 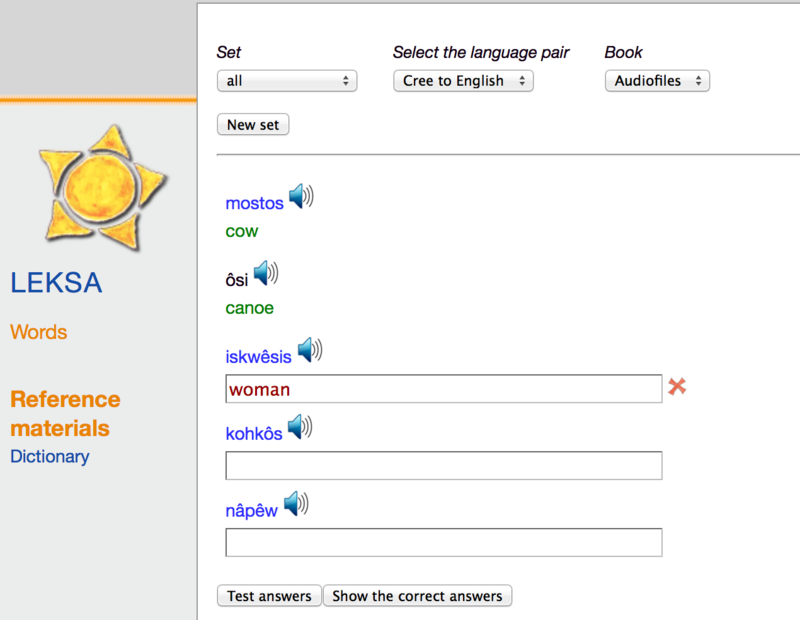 The teacher can give deeplinks for specific exercises to the students, links which include the relevant settings. The student may limit the vocabulary to the vocabulary of the textbooks or the curriculum. In the Leksa-program s/he may choose semantic field instead of book. The student may try as many times as s/he wants, before s/he asks for the key. The student may ask for hints about the inflection, and then try again (not implemented yet). There will be links to grammar explanations (not written yet). One may let the programs accept answers without macrons. New tasks are generated by the programs on the fly, thereby producing thousands of different tasks. It is possible to make to program in two versions, either using Roman letters or syllabics. It is possible to adapt the program to varieties (dialects, different spelling conventions), and make a menu for choosing between them. In a fully developed program, there may be a 'login' procedure. The teacher may log in and see which tasks the students have been working with, and the students may follow their own progression compared to the curriculum. The names of each program may be changed to names sounding better for the Cree students. The idea behind the programs is that if the students may practice grammar alone, and still get immediate response to their work (the computer is their assistent teacher), then the teacher may spend more of the time in the class to practice other parts of their language skills.